If you just want to get between Los Angeles and San Francisco as fast as possible, Interstate Highway 5 is the way to go. It's 382 miles from the city center to city center. 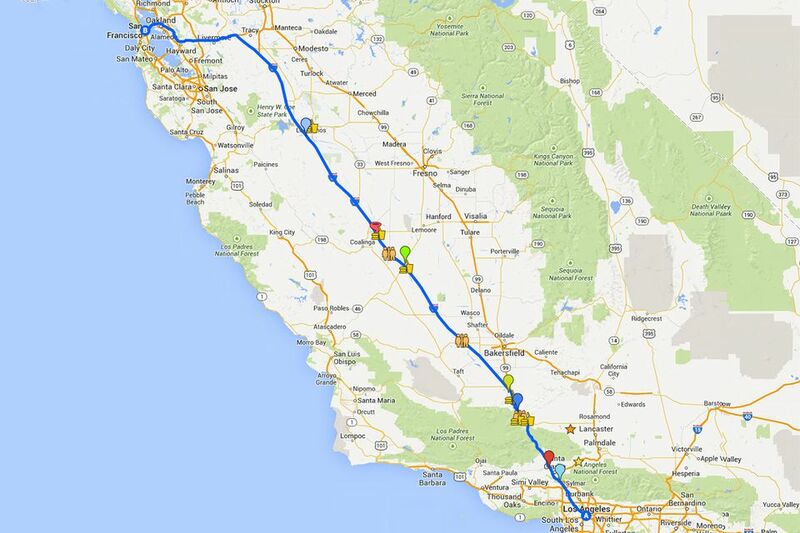 It’s tempting to say that driving those 382 miles at 70 miles an hour will take 5.5 hours. If you have the appetite of a pygmy seahorse and bladder of a blue whale, it might be possible, but to be realistic, it will take at least 6 hours and a bit longer if you stop for a meal. Most map apps and GPS systems default to the I-5 route, so you might wonder what the big deal is with this guide. Those resources can give you directions, but they won't warn you where to close your outside air vents to avoid a big stink. And don't trust them to give you all the practical tips and tasty tidbits you'll find below, either. I-5 runs down the middle of California. 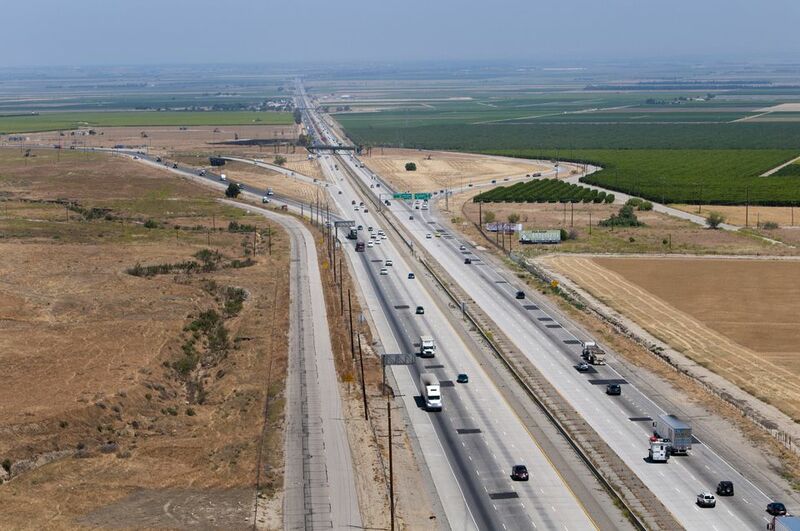 Between LA and San Francisco, it passes through the area agricultural and farming area that Californians call the Central Valley and which is officially the San Joaquin Valley. It’s one of the state's most productive agricultural areas where as much as 12% of the total U.S. agriculture production begins. Some of the crops you may see growing include cotton, table grapes, raisin grapes, citrus, stone fruits, almonds, and pistachios. You'll see all kinds of things being transported on the road, from large equipment to onions and tomatoes. The best way to get out of LA depends on where you are. Use your mobile app or GPS toward San Francisco. If you're using a paper map, navigate to Santa Clarita, which is on I-5. Once you get onto I-5 north toward Sacramento, you only make two highway changes: Interstate Highway 580 West and then Interstate Highway 80 toward San Francisco. Leave San Francisco going east across the Bay Bridge, following I-80 to I-580. Then take I-5 south. Depending on your end destination, stay on I-5 toward downtown and San Diego or exit onto U.S. Highway 101 or Interstate Highway 405 to get to other parts of Los Angeles. If you’re traveling from San Jose instead of San Francisco, take U.S. Highway 101 south to Gilroy and cross over to I-5 using CA Highway 152. Some curious and unique sights appear along I-5 - or maybe they just seem unique because there's so little else to see. These items are listed in order from LA going north. If you’re traveling from San Francisco going south, just start at the bottom of the list and work up. If you’re northbound and using the highway signs to track the distance to your destination, you may be frustrated by seeing distances to Sacramento only, but don't fret. The distance to San Francisco is just about the same. No matter which direction you’re going on the mountainous part of this drive, you’ll pass trucks going very slowly in the right lane - and slightly faster-moving ones pulling out to pass them. They force automobiles into the left two lanes as a result, so you’d might as well just drive there to begin with. On the steep downhill sections, you may have to apply your brakes to keep speed under control. Near the town of Sylmar and just south of the CA Highway 14 junction at Exit 162, the water cascading downhill on the east side of the highway is part of the Los Angeles Aqueduct. Completed in 1913, it runs over 200 miles to carry water from the Owens River to LA. In Santa Clarita at Exit 170, you can see a theme park with one of the country’s biggest collection of extreme roller coasters. When Six Flags Magic Mountain opened in 1971, the area surrounding it was more or less unused, giving an idea of how much the Los Angeles metro area has expanded. You might think you made a wrong turn north of the town of Castaic (Exit 176). You'll suddenly see the oncoming traffic lanes on your right. There's a simple explanation: crossing the roadways allows the uphill part of the road to follow a more gradual climb. The steepest part of the drive is the 10-mile stretch north of Castaic. The elevation change is enough to make your ears pop — and there’s another steep section just north of Grapevine. The hills near the tiny town of Gorman (Exit 202) put on a rare but beautiful display of spring wildflowers when conditions are right. In the best years, the hillsides near the CA Highway 138 Exit look like a watercolor painting. Fort Tejon (Exit 210) was built in 1854 and abandoned ten years later. Today, it’s a state park. Tejon Ranch is the most massive contiguous expanse of private land in California, its 422 square miles larger than the City of Los Angeles. Founded in 1843 as a Spanish Land Grant, Tejon Ranch is still primarily a ranching and farming business. Named for the creek which runs through it or for grapevines that once grew in the area depending on who you ask, The Grapevine is the nickname for the road where it crosses the mountains. It’s the longest, steepest section of I-5 between Los Angeles and San Francisco, with a 6% grade (about a 1,500-foot drop) over 5 miles on the north end. At the base of the mountains, you'll find an outlet mall and lots of places to eat. A little north of the U.S. Highway 99/I-5 split (Exit 221) on the west side of I-5, those big pipes climbing the hill are also part of the Los Angeles Aqueduct. In that same area, you’ll see some oil well pumpers nodding silently in the middle of a vineyard. Parts of the valley are very dry and — no kidding — it's not unusual to see a tumbleweed blowing across the road. A highway rest stop might seem like a strange place to go bird-watching, but yellow-billed magpies are a frequent sight around the Buttonwillow Rest Stop at Exit 259. They’re large relatives of crows and found only in California. You can only make this stop if you’re going north, but at Exit 390 northbound, the Dos Amigos Vista Point overlooks a pumping station on the California Aqueduct, a network of canals, tunnels, and pipelines carrying water from the Sierra Nevada Mountains to Southern California. Boredom and frustration are real hazards on I-5. Check out the other ways to get between the two cities before you choose your route. High winds and occasional winter snow can close the highway at Tejon Pass. It’s better to know about these closures before you start your trip so you can take an alternate route. If the road is closed, U.S. Highway 101 is your best alternative. It will take 1 to 2 hours longer than I-5. You can find a guide to making that drive here. One of the easiest ways to find out about any delay is to use an app that shows traffic slowdowns. You can also call the CalTrans highway condition hotline at 800-427-ROAD or check conditions on the CalTrans website at dot.ca.gov. I-5 is a major corridor for trucks. I-5 is only two lanes in each direction. If a truck going 57 miles per hour passes a truck going 55 miles an hour, it pulls into the fast lane — and every automobile behind the truck has to slow down until it's back in the right lane. Impatient drivers tend to tailgate, and everyone is at the mercy of the worst driver in the group. It can be foggy. November through February, the San Joaquin Valley is subject to heavy tule (rhymes with newly) fog, which is also called radiation fog. It forms on cold, clear, windless nights. Incredibly dense and dangerous, it cuts visibility to as little as a few feet, making driving difficult. It can be windy. On windy days, blowing dust can also make your trip less pleasant, and it can occasionally reduce visibility on the highway. This is more of a problem in the spring when farmers plow their fields and in summer (California’s dry season). Some things stink. A hazard of a different kind lurks near the CA Highway 198/Harris Ranch exit, which is Exit 334. The Harris Ranch feedlot covers nearly 800 acres and has the capacity to produce 250,000 head of fed cattle per year. It also generates quite a stink. We recommend setting your air intake to recirculate to keep it out of your vehicle. Southbound, do that at Exit 334 and northbound close them at Exit 349. The fast-growing Sundance Feedlot south of there is becoming another olfactory hazard. To avoid the unpleasant experience, set your ventilation to recirculate at Exit 234 if you’re going north - or at Exit 239 (Bear Mountain Road) and Exit 244 (Taft Highway) going south. New feedlots are springing up along the road so fast that it’s hard to keep up with them. Keep an eye out for areas that have a lot of low, metal-roofed sheds. If you’re driving on a summer night, the smell carries a long way and you can’t see them. The easiest way to cope is to set your ventilation on recirculate and leave it there. You'll find an exit with gas and food about every 30 miles or so. Some also have lodging. The ones with the largest selection of eating places include Gorman (Exit 202), Frazier Park (Exit 205), Grapevine (Exit 219), Buttonwillow (Exit 263), Kettleman City (Exit 309) and Los Banos (Exit 403). An alternative to the same old fast food joints at the Kettleman City exit is Bravo Farms, where you can get something to eat, do a little shopping for souvenirs, buy road snacks, and give the kids a chance to run around for a little bit. You'll find several "official" rest areas along I-5, at Exits 206, 259, 320 and 386. They have toilets, pay phones, picnic tables and a place to walk your dog. If you need more information than that, you can get lots of it in the I-5 Exit Guide. In the summer, temperatures in the central valley peak above 100°F. It's a good idea to have some water along, just in case of a breakdown. Antelope Valley: California poppies abound when the conditions are right, with peak bloom between mid-February and mid-May, making it well worth a detour. Exit 198A at Highway 138 east, about 70 miles north of Los Angeles. Vasquez Rocks: These odd rock formations have appeared in over 100 movies and television shows, including the Star Trek films and television series, scores of 1950s and '60s Westerns, and The Flintstones movie. You'll find them 14 miles off I-5 on CA Highway 14 (Exit 162), about 45 miles north of Los Angeles.